Memorial Day is coming, and it’s the kick off for casual summer entertaining. I like to serve easy, make-ahead appetizers to keep the guests happy before it’s meal time. Dip is universally popular, and I often make guacamole or buy hummus. 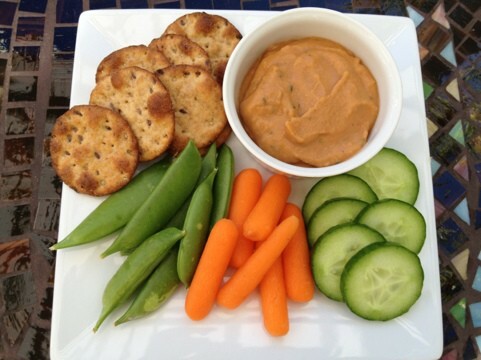 For a change of pace, I came up with a new dip recipe for roasted fennel and white bean dip. With this ratio of ingredients, the fennel is a subtle, background flavor with a slight licorice taste. Also, I have made this dip without the fennel, and it’s extra quick to prepare and still delicious. 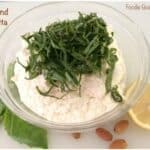 This dip develops more flavor as the ingredients meld together overnight, but it can be served the same day. 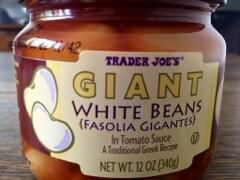 This recipe uses marinated white beans in a tomato sauce from Trader Joe’s. 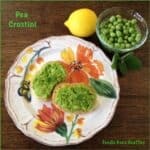 If you don’t have that specific product, just substitute one can of regular cannellini beans (rinsed and drained) plus add one more tablespoon of olive oil. It’s a flexible recipe. 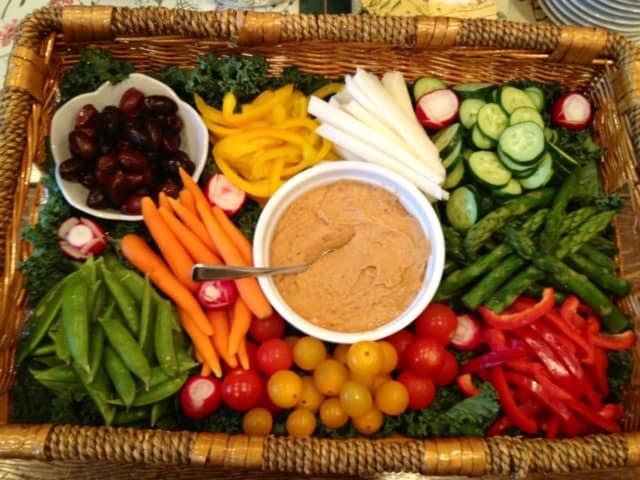 I serve this dip with crudité (vegetable dippers) and baked multigrain pita chips. For company, I like to make a large basket of farmers’ market vegetables, as seen in the photo at the top. All the variety and bright colors make an attractive presentation, yet it’s quick and easy to assemble. You can pick your favorite seasonal vegetables. 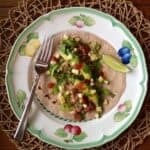 I use mostly raw, cut up veggies. My basket includes olives, yellow peppers, jicama, radish roses, cucumbers, steamed asparagus, red peppers, red and yellow cherry tomatoes, snap peas, and carrots. Tip: the bottom of the basket is lined with plastic wrap then curly kale leaves. I made this plate one day after school as a snack for my kids. My 5 year old declared this plate as the “best snack ever.” Just take a second to arrange the healthy food artfully, and then the snack feels special. They’ll never miss the junk food. 1 large clove of garlic with peel on. 1. Preheat oven to 350 degrees F. Use convection oven if you have it. Slice the fennel bulb into even-sized chunks, about 1/2 inch thick. Toss the fennel and garlic in 1 tablespoon of oil and sprinkle with 1/4 teaspoon salt. 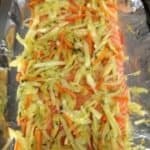 Spread the fennel and garlic on a metal baking sheet into a single layer. 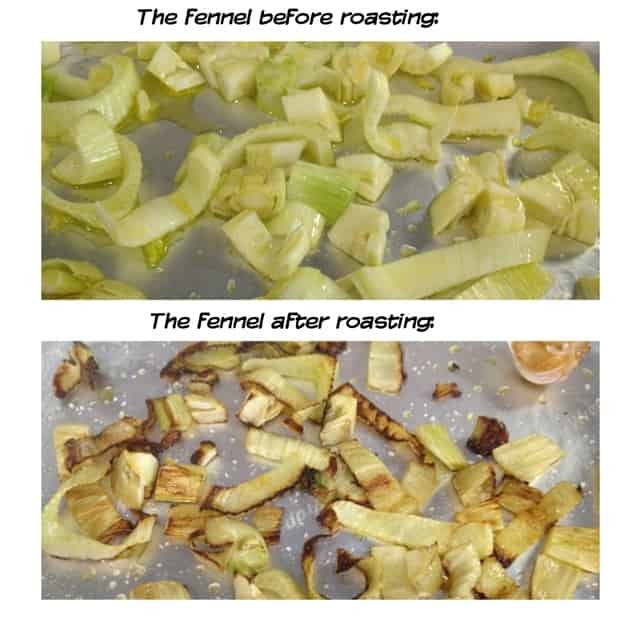 Roast in the oven, and turn the fennel with a spatula a couple times during the cooking time. Fennel is ready when it is tender and brown around the edges, about 25-30 minutes. Take care to not burn the edges. When the garlic is cool enough to handle, remove the peel. 2. Take out a food processor and fit with the metal chopping blade. 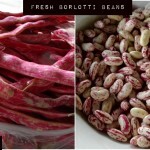 Add in the roasted fennel, the roasted garlic, 1-1/2 tablespoons olive oil, beans, rosemary, 1 teaspoon salt, and pepper. Purée until smooth and creamy. Taste and adjust seasoning and olive oil as needed for flavor and consistency. Refrigerate to chill. Serve with chips and vegetable dippers.